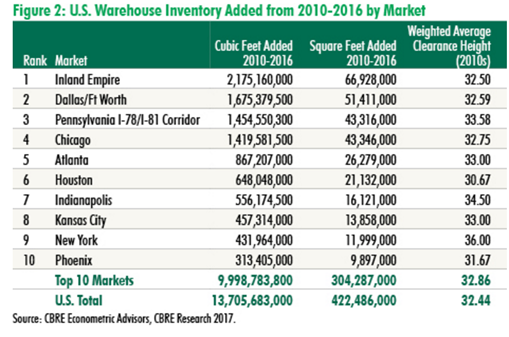 ​ ​​TEXAS – The Dallas-Fort Worth and Houston metropolitan areas topped CBRE’s Top 10 list of cities that added warehouse square footage to their respective markets from 2010-2016. DFW was second on the list, adding 51.4 million sf during the time period—while Houston was sixth in line, adding 21.1 million sf. The information was reported in CBRE’s U.S. MarketFlash Measuring Up: Why Cubic Feet Matter​ report, which not only focused on square footage, but also cubic feet. Also check out Houston Industrial Market Research​.